Front view. Can you tell it's leaning like the tower of Pisa? Look up. There's beauty above you. I thought I would write about the back scenes that can lead to a bit of artistic trauma and a whole lot of DRAMA. If you saw the last post, I had new work for the show in Shelby. 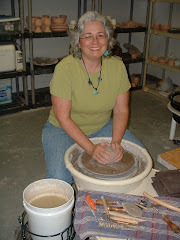 But prior to that happening, I had a wonderful timeline of making work and firing and finishing work that would lead up to a calm, effortless setup. Ha! The weather has played havoc with my firing because of temperature. My kilns are outside, under a shed roof and have computerized controls, which are not supposed to work as well when the temperature drops below 32 degrees. So that lovely timeline got to be a scramble, fire to the last minute possible. Then the setup.....Shelby is about 25 miles from my studio and Tuesday, set up day saw me struggling to get my old setup in the car and get there in time. Unpacking quickly in the rain was going ok until I got to the last table, which got stuck in the van. It has legs that are permanently screwed to the top and it pretty unbendable without breaking. I must have stood in the drizzle in the parking lot shouting at this table for 10 minutes. They were not pretty words, either. My sister later said it was probably caught on a surveillance tape somewhere and people got a good laugh at the struggle I was going through. Finally I manipulated it so I could squeeze it out without snapping all the legs off. Then off to the races of unpacking and setting things out. But only half the things, because the other half was still cooling in the kilns. Yesterday I left several hours early, unloaded the rest of the pieces in a whirlwind and finished the setup just before 5:00pm. Only time to change clothes and put on my smiling face before the excitement started. Obviously this isn't all the work. And some of it was photographed quickly as it came out of the kiln, so the colors are brighter in person. I will have big carved bowls and vases and altered bowls and little brilliantly colored leaf bowls and even some little valentine tiny bowls for those needing to give some love. Come out and see if you can. Shelby is a great town with lots of exciting things to do, so it's worth a day trip. The show will be up to March 6th.